…NO! This laser diode would be destroyed by ESD (and we’ve done experiments to prove it). 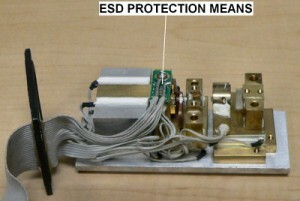 As noted in the ESD Protection Requirements section of our Human Body Model-related web page, in order for the laser diode to be safe from ESD, the protection means must offer an impedance less than 50 milliohms over a frequency range of 20MHz to 1GHz! 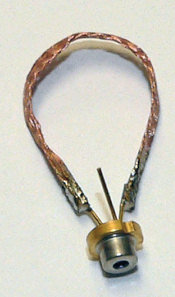 Due to the “long” length of this shorting wire, the resulting inductance offers an impedance greater than 50 milliohms at 1GHz. …MAYBE… At 5 cm (round trip) there is a 50-50 chance that this laser diode would be destroyed by ESD (again, we’ve done the experiments to prove it). Basically, the inductance at 1GHz is still a bit too high to offer complete protection. These two experiments offer an important lesson. They demonstrates that, in order to be effective, the ESD protection means must be closer than 5cm (round trip) to the laser. 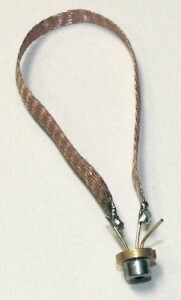 From a practical standpoint, this this means two leads with 2.5cm length. 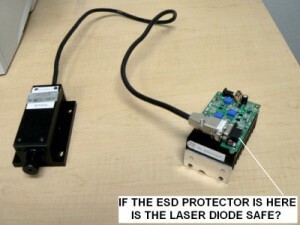 Ideally, the ESD protection means should be placed as close as possible to the laser diode. …NO! As discussed above, the distance is far too great to prevent ESD damage. A final question: Are your laser diodes protected by LASORB? It is the only ESD protection device specifically designed to protect laser diodes. This website has additional information about how LASORB outperforms all other methods of diode protection.